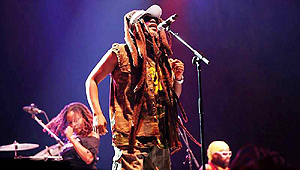 Steel Pulse may have explored various styles of music since they started out in 1975, but when it comes to the message, the UK’s Grammy – Winning reggae band has remained close to their roots. Indeed, the group have continued their commitment to fighting injustice, educating the masses, and promoting positive messages through spiritually uplifting music. 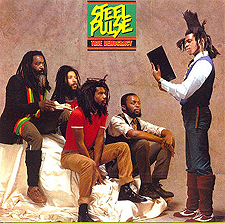 As I'm sure you are all aware in this day and age, Steel Pulse is a roots reggae band from the Handsworth area of Birmingham, England. They originally formed at Handsworth Wood Boys School, composed of David Hinds (lead vocals, guitar), Basil Gabbidon (lead guitar, vocals), and Ronald McQueen (bass). 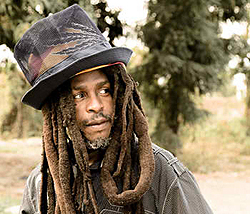 Their Grammy award was awarded for their 1986 album Babylon The Bandit, but Steel Pulse has received nominations for Victims (1991) and Rastafari Centennial (1992) also. 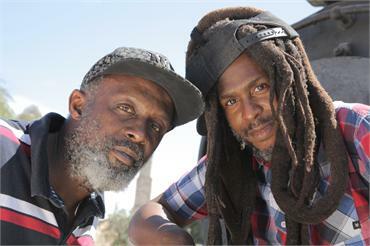 Steel Pulse - now down to just David Hinds (Lead Vocals, Rhythm Guitar) and Selwyn Brown (Vocals, Keyboards - are currently working on a new album, which will be released later in 2013. And also a documentary of their long career which features live footage and interviews. 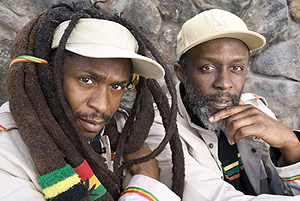 I recently sat down with lead singer David Hinds, and, taking it from the top, being that he has been an original member of Steel Pulse since it formed in 1975, what had changed the most for him about the business in the past 38 years? "All I can say is “thank God for the Internet.” One can exercise their efforts without going through record labels; only to receive a small fraction of what has been financially generated. The computer has managed to inform the world of practically all the skullduggery that is out there." "The downside is that unfortunately, the very same computer has developed a generation of people that are for the most part, oblivious to the years crafted from their predecessors. I believe originality comes from deep spiritual creativity with endless hours of work attached to it. With today’s generation, only a tiny percentage can fathom what it takes to be innovative. You don’t have to know the rudiments of music to be a household named “pop star,” nowadays. Am I losing you?" Nope, I'm still with ya! Funnily enough, at the beginning of your career SP aligned themselves closely with sympathetic elements of the punk movement (Stranglers, XTC, etc. ), before finding a more natural home supporting Burning Spear and such. Those early days must have been fast-paced, raw fun, and musically dangerous, were they not? "Yes, they were. Everything was happening so fast back then. Plus in the world of reggae there was no real template to model ourselves on, especially in the UK where there was that fight in our black communities to get our style of “British Reggae” established." If you could name the SP album that still remains your best work to this day, which album would you choose - and why? "It is really hard for me to say, ‘cause I for one go through a series of mood swings. Once we complete an album, I am edging all the months after the recordings until they are released to the world. Then when they are released I don’t care much to hear them again. Having said this, there are times I am forced to listen to them it if I’m stuck in a club, a bar or someone’s car who has offered to give me a lift, etc. From that I begin to rationalize, recapture and reminisce. From that I must say that True Democracy and African Holocaust are the two of my favorites. But I did say I suffer from mood swings. If you ask me this again some other time I will probably tell you Handsworth Revolution and Earth Crisis. Ha Ha Ha!!" The first single released from your upcoming new album is 'Paint It Black,' a song dedicated to the hundredth anniversary of Rosa Parks. What made you contemplate having this historical element as the centerpiece for your first single off a new SP album since African Holocaust (2004)? "There was no real contemplation. 'Paint it Black' might not even make the finished album. Recently I have, because of the age of the Internet, been trying to do things more spontaneously. We just came out of a second Inauguration for the 44th President of the USA, plus a 150th anniversary of the Emancipation Proclamation. Then it is the 100th birthday of Rosa Parks, the 50th anniversary of the slaying of that maid in Baltimore, named Hattie Carroll; the 50th anniversary of the OAU formed in Addis Ababa, also 50years since the “I Have a Dream” speech, not to mention the murder of Medgar Evers, that’s been 50 years too. I think it was only appropriate to start off with the conceptualisation that the fans have adored us for all these years. It’s commemoration time and “Paint it Black” along with the still photos depicting the circumstances, says it all." Having watched the video for it, your lyrical statement is obviously one of admiration and jubilation for the fact that, as you yourself have put it, managing to "have a man of color as a leader in this world, in the White House." How important was it for you, as a person, back when President Obama took the position as Leader of The Free World back in 2008? "On one of my first visits to the United States on tour, I came across an old black man who was adamant on following the band across the states, selling our T-shirts from out of the truck/ boot of his car. Every once in a while he told me how much he feared for the band whenever we went into the towns of the Deep South. He went on to tell me how it was for him back in the days. He said he always wanted to be an airplane pilot but he had it drummed into his head by his white schoolteachers and other associates that he could never be that and that he would be wasting time trying to achieve that dream, especially in such racial climate." "First of all, I never knew I would live to see a Black President of the United States, although the likes of Bobby Kennedy and Dr King Jr. predicted it. Secondly, I asked myself over and over “how many of us, like that old man, had our dreams killed due to racism.” This has never been about Obama. The picture is much bigger than that. This is about everyone under Jah’s sun realising that there’s nothing exclusive to the wealthy and the elite anymore. Those days are over. Positions in life can be achieved and attained by anyone. As the saying goes, “The biggest man that you ever did see was once a baby.” Oh by the way, “Men of Honor” has been one of my favourite films of recent years." Living here just outside of Detroit, Michigan, down the road is the same actual bus that Rosa Parks made history on at the Henry Ford Museum. I have sat on it myself twice now, and so I was wondering if you had ever done much the same thing on a visit here to the US, perhaps? "Funny you should say that. Prior to blogging “From Natty to Hattie,” our cover of Bob Dylan’s song 'The Lonesome Death Of Hattie Carroll,' my intention was to revisit the actual hotel where she was slain, in Baltimore. A friend of mine who lived in that neck of the woods checked it out and alerted me that the hotel, called the Emerson, doesn’t exist anymore. You can count on it…. that will be on my agenda on my next visit to Detroit." Always a band fighting injustice and educating the masses via your lyrics, what would you say is the underlying message for your fans on this upcoming new album? "The underlying message? That’s a tough one. Still not sure which tracks will make the album. But generally speaking, it will be covering various aspects of those disenfranchised. And no… “Disenfranchised” will not be the title of the album!" Still to this day SP is the only UK reggae group to have ever won a Grammy! I find that an amazing fact, but nonetheless true. What do you yourselves put that down to? "I put that down to our perseverance of the USA. We came, We saw, We conquered. Not many Uk reggae bands have had the opportunity or finance to travel and go through the rituals to get acclaim. A Grammy cannot be given to an act that the world (USA) has never heard about." Adding to the list of one-off's, in 1993, at the request of the Clinton Administration, SP became the first reggae band ever to perform during the inaugural festivities at The White House. An honor, for sure, but what do you recall from that day and was it all positive? "My recollection of that day? The first thing that comes to mind was how cold it was. It has also been one of the greater milestones in our career. We made Jamaica proud, too. It was all-positive." When can we expect your new feature-length documentary to come out and please do tell us more about what we can expect to see? "What you are expecting to see and what you will see might be two different things. What I would like to leave you with is that feeling that you have seen a reggae documentary that has a story so far removed from the reggae archives that are already out there, that you will take it on yourself to be part of the pilgrimage of it getting maximum exposure. Ya dig?" I dig, my friend. I dig! OK, finally, and having some fun here with a journalistic curve ball, we here at Exclusive Magazine love Penguins (the birds, not the chocolate bar or the hockey team!) - so we are wondering if you have any love for them also?! "Well, put it this way, I have no intentions of throwing them into jail like what Batman use to do. Neither do I plan on eating them. It beats me why they are called birds and they can’t fly. Having said this, I can see them in a Racial Harmony commercial dawned in their “black” and “white” coats uttering the infamous phrase of the late Rodney King; “Can’t we all get along?”"
Listen to 'Paint It Black' Here!